•	Mark Gardner's Eagle Court of Honor will be held 1:00PM on Saturday, May 3 at St James . Lite refreshments will follow. The date is set so put it on your calendar, As always Troop 75 Scouts and Scouters do not need an invitation but please pass numbers that will be attending to the Gardner family when asked by your SPL or via e-mail. On Saturday, February 22, 2014 Troop 75 attended and helped host the 2014 Connecticut River’s Council Klondike at Camp Tadma in Bozrah. The theme of this year's Klondike was "Lost in the Arctic". It was a big success, with all of the attending troops enjoying the events. Spaced throughout Camp Tadma were various events organized by the hosting troops, including a fire-building competition, pulling a sled through an obstacle course, and attempting to hit targets with a giant sling shot. On the day before the Klondike, Troop 75 traveled to Camp Tadma for setup. We stayed in one of the cabins for the night along with one other troop. The next morning we ate a breakfast of pancakes and sausages and set up our stations as the other troops began to arrive. The competitions soon began. At each event, patrols were judged on how well they performed a certain task. Depending on their outcome, one to six golden nuggets were awarded and the patrol could be eligible for a ribbon as well. The golden nuggets could be exchanged for candy. Troop 75 hosted an event where you had to tie a tripod lashing, lift your sled (you had been pulling one all day!) over a "river" using a tripod, and finally cross a rickety bridge. This event was judged on teamwork, time taken to complete the course, and how much of the challenge you completed in the allowed time frame. The second event Troop 75 hosted included pulling your sled through an obstacle course. This event was judged similarly to the troop's other event. Some of Troop 75's adults hosted an event where the patrol members were asked a number of questions about the Boy Scouts. Depending on the amount of questions that were answered correctly you could get more gold nuggets or have them taken away. At lunch time the events stopped, and each troop went to their assigned campsite to eat lunch. Troop 75 had meatball subs for lunch inside the mess hall. In the afternoon, after the events closed, the leaders of each event calculated who would be receiving ribbons. Troop 75 stayed until everyone else had left for home to insure that Camp Tadma was clean as could be. Tired after a long day, we left with good memories while looking forward to the next Klondike. Will Carver Bake Sale Thank you!! My renovation of the PCCC food pantry can begin. Support from PCCC members, Troop 75 and St. James Church Bakers, my Mom and Mrs. Karin Davis and Mrs. Holly Cyr PLUS overwhelming support from everyone we raised $515.15 to support my project. Eagle Scout Project of Life Scout William Carver from Troop 75. All Donations were greatly be appreciated. 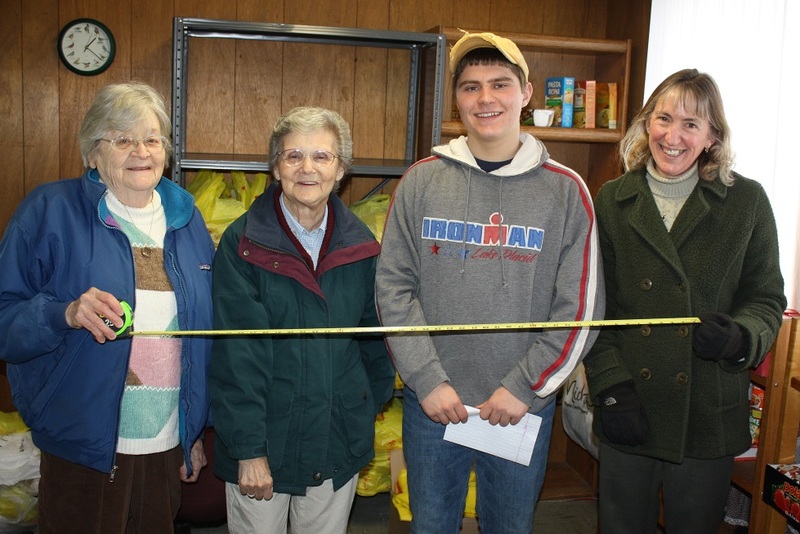 REASON: To support the renovation of the PCCC food pantry. All Donations will greatly be appreciated. 860-861-1487 For Bake Sale goods and donations. Thank You. Please come to Zach Moran's Eagle Scout Ceremony at the Preston City Fire House on May 5th, 1pm. Come and celebrate Zach's many years of scouting with Preston! If the weather is good, Zach is planning to cookout at the pavilion...if the weather is not then the ceremony will be held in the firehouse. Posted 4/24/13 during scout meeting by Mrs. Gardner.